Peculiar puzzles, ridiculous riddles, and a-mazing mazes guaranteed to keep the fun rolling! Perfect for rainy days, car trips, or after school, these games, puzzles, riddles, and mazes will help you have fun no matter what the day brings. So sharpen your pencil and get ready to puzzle! Beth L. Blair is an illustrator and graphic designer. She is the author and coauthor of numerous Everything® KIDS’ books, including The Everything® KIDS’ Gross Mazes Book and The Everything® KIDS’ Animal Puzzle and Activity Book. She lives in Canterbury, New Hampshire. 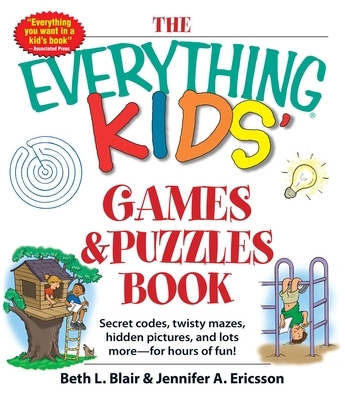 Jennifer A. Ericsson is a children’s book writer and coauthor of several Everything® KIDS’ books, including The Everything® KIDS’ Puzzle Book and The Everything® KIDS’ Pirate Puzzle and Activity Book. She lives in Concord, New Hampshire.